This is a photo of Mohamed Osman Mohamud. It was released by the Multnomah County Sheriff's office. 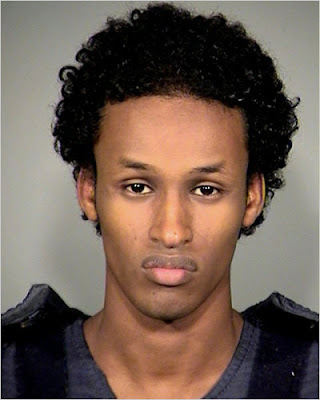 Although Mr. Mohamud grew up in Somalia, he's is a naturalized American Citizen. He was just arrested for a plot to detonate a bomb at the Portland Christmas tree lighting ceremony in Downtown Portland, Oregon. Here he is showing classic signs of mild to moderate disgust. Mr. Mohamud's "mustache area" is tightened and his upper lip is raised. His lower lip is also elevated and protruding. His nostrils are slightly dilated and his forehead is relaxed. Once again, this is and example of mild to moderate disgust - somewhat difficult to spot, but you don't want to miss it. Frequent and prolonged displays of disgust and contempt (even if subtle) can be warning signs as they are strong, negative emotions; and while they're contextually displayed every day by most everyone, they're also common emotions displayed by those who have strong ideological basis for committing crimes and acts of violence. Nonverbal Communication Analysis # 2251: Updated FBI Photo of Escaped Convict Kenneth Conley - What Warning Signs do you see in his Body Language?